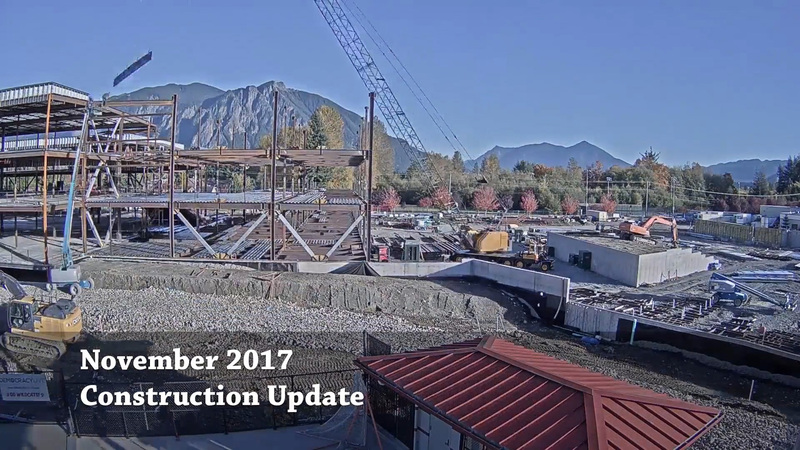 Click here to watch a time-lapse video of building activity on the Mount Si High School site from mid-October to mid-November. 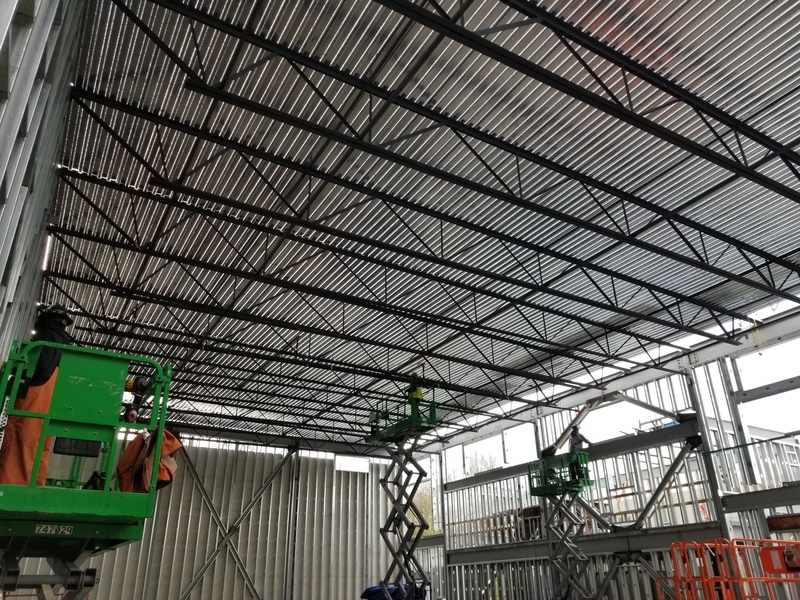 Since completing the steel framework for areas A and B earlier this fall, a broad range of activities continue that include mechanical, electrical and plumbing rough-ins; roofing installation; steel stud wall layout; spray-on fireproofing; and preparation for the fire sprinkler system. For areas C, D, E and F, the steel fabrication process resumed in October and will continue through December. (See site map below.) Underground utility work to install sewer, water, mechanical, electrical and telecommunications systems continues where needed throughout the site. Additionally, the north parking lot, adjacent to Area A (which will serve as the new freshman campus), was treated with asphalt this month. 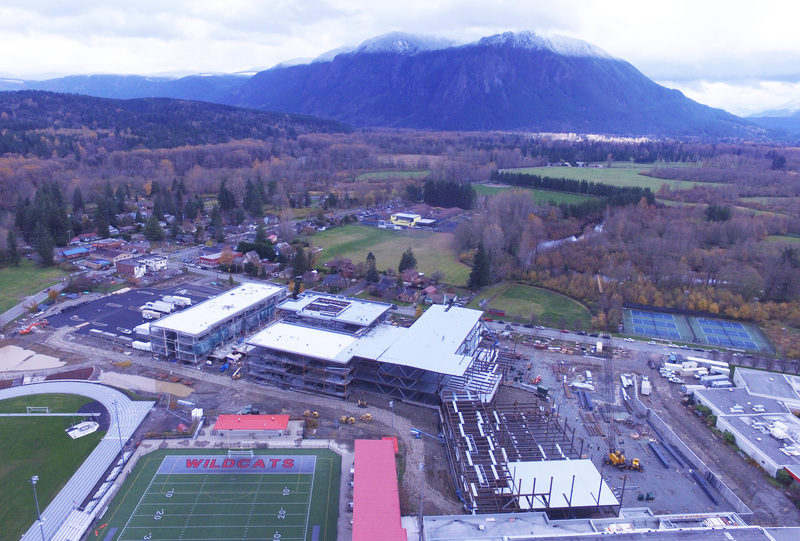 The Mount Si High School project remains on budget and on schedule. Photos from November 2017. At left, the asphalt-treated north parking lot is serving as a staging area for equipment and construction activity. 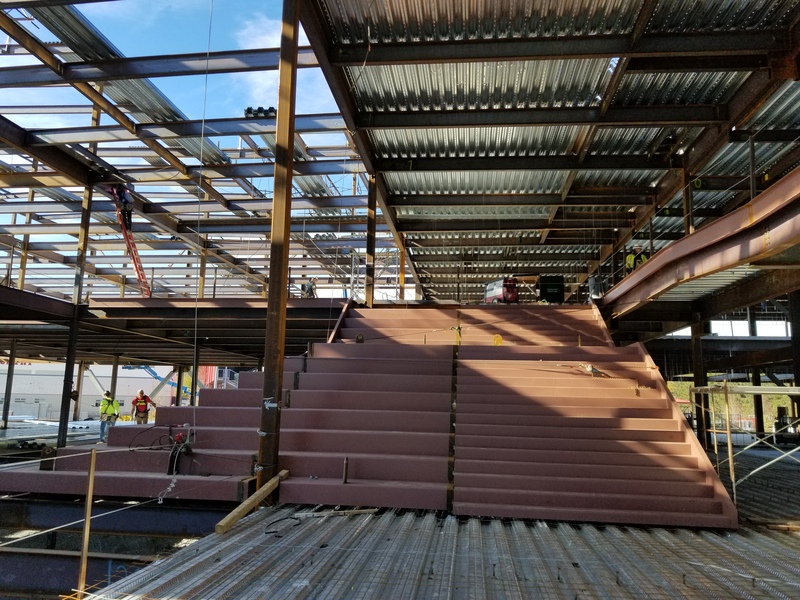 At right, a large steel stairwell was added to connect the first and second floors in Area B. For more photos and details, read the November 2017 Status Report from the Project Manager. as well as in the SES gymnasium building the distance toward Mount Si. 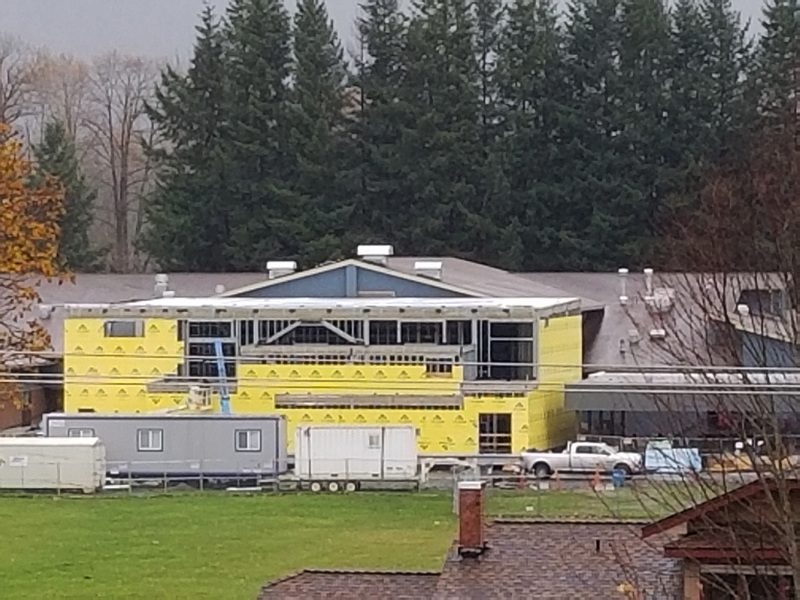 The interior walls of the new Snoqualmie Elementary School (SES) gymnasium have been constructed, and the exterior walls are being closed in this month. The roof structure is also nearing completion, then roofing will follow. 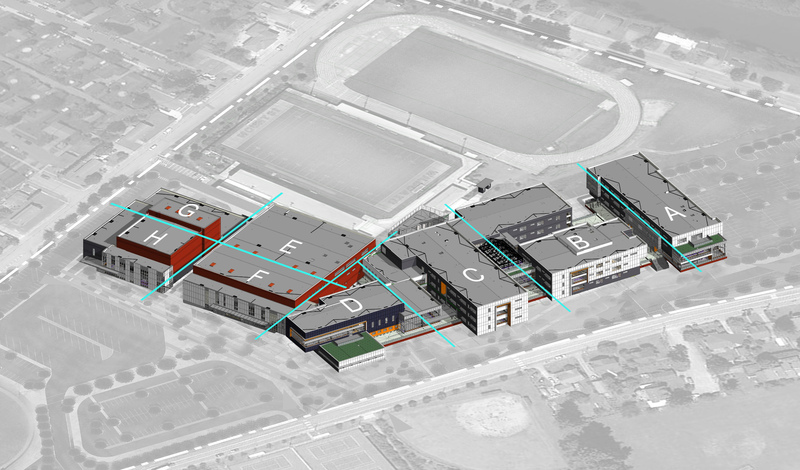 The building is very close to being enclosed, after which interior flooring and athletic equipment can be installed. This project is on track to be completed by the end of December 2017. Photos from November 11, 2017. At left, a view from the inside of the new gymnasium as the walls and ceiling near completion. 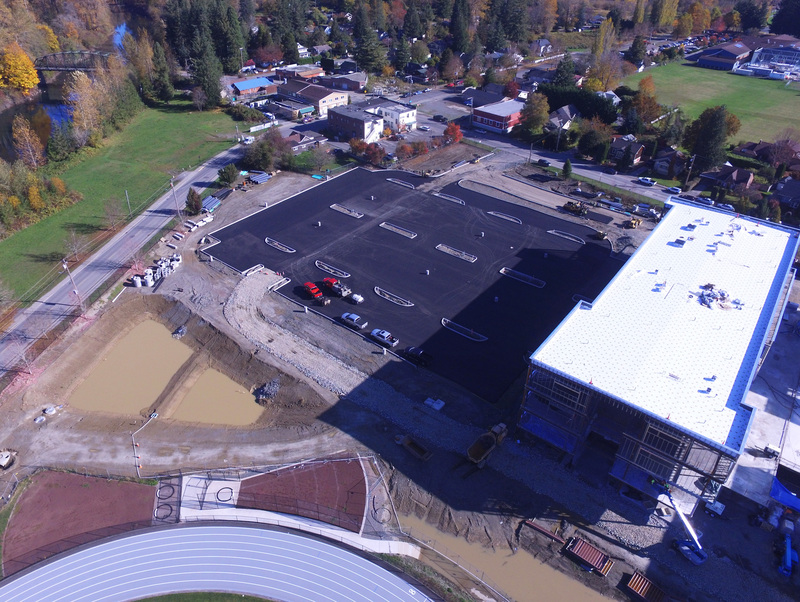 At right, is a magnified view of the new SES gym, taken from on top of the new MSHS structure.